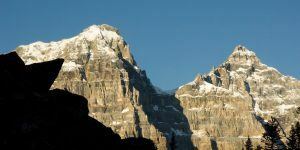 Don't just discover the Canadian Rockies. Explore them. Mother Nature broke the mold when she made the Canadian Rockies, and you won't truly understand what we mean until you join us for a bonanza that's so far off the grid, you may never want to come back. Welcome to raw wilderness, with jagged ice caps, the smell of fresh pine and a soundtrack of streams that take you back to your roots. We'll ride deep into the mountains of two Canadian Rockies national parks (both UNESCO World Heritage Sites), past grand ponds and lakes, through canyons and across spires of rock carved from millions of years of glacial erosion. 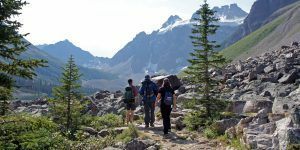 Then, we'll swap our cycling cleats for hiking boots and journey deep into Larch Valley, for an explorer's buffet of flora, fauna and foliage. That, along with canoeing on one of the most beautiful lakes you are likely ever to see-this is the kind of Trek Travel adventure that truly has it all. Well, we take that back. The one thing you won't find here is a strong connection to the modern world. Because when you're rediscovering your relationship with Mother Nature, you don't want anything to disturb you! Just...congratulations! On the itinerary, the well-balanced rides, the hotels, the support and most of all the guides. The trip was perfect. Welcome to the Canadian Rockies! After meeting your guides in the lobby of the Fox Hotel and Suites at 11:00 AM and taking a short shuttle to Canmore, we'll enjoy a lunch of fresh local treats. After, we'll prepare for our first ride of the trip. Your guides will familiarize you with your Trek bike, including a bike fit session along with safety talks and expectations for the week. We'll then set out on our first ride of the trip: a pedal toward Banff along Legacy Trail, a system of bike path that winds through incredible scenery and leads us into the national park. This first ride follows a beautiful path through the forest, which will warm up our legs as we cruise past lakes and mountains. Our last climb is on Tunnel Mountain, and brings us to our hotel nestled above the busyness of Banff. It's the perfect place to start the trip, hidden away from the hustle and bustle, with plenty of close views of elk and deer on the grounds. This evening we'll gather at the hotel for a social hour and first-night celebration. It's great to wake up in Banff. The wilderness gently stirs you naturally and after breakfast at the hotel, we set out on a locals' favorite loop out of Banff toward Lake Minnewanka. Make sure to get some photos of the hoodoos eroded rock spires and the view of Banff at “Surprise Corner”. We'll pass Lake Minnewanka and Two Jacks Lake and possibly a Bighorn sheep or two, and stop at Cascade Ponds for a picnic lunch and maybe a refreshing swim. After we return to the hotel, the rest of the day is yours—relax, book a spa treatment in town, and explore Banff! Dinner is on your own, perhaps with newfound friends, at any of the excellent restaurants in Banff. This morning starts the same as yesterday, with Mother Nature as your alarm clock and breakfast at the hotel. Today's ride out of Banff follows the old Highway 1A, also known as the Bow Valley Parkway. It's a main corridor for wildlife traffic that runs parallel to the Bow River, an important water source fed by the Bow Glacier, which runs almost 600 km toward the prairies. Watch for elk and black bears as we pedal to our next activity—a short hike along the walls of Johnson Canyon to see its powerful lower waterfalls. We'll then ride past some impressive views of Castle and Storm Mountains. Choose to bank some extra kilometers up Vermillion Pass to the Continental Divide. We'll stop for lunch in Baker Creek and then head to Lake Louise, where our shuttle awaits to our next hotel. You're sure to love Moraine Lake Lodge, a special retreat where guests enjoy nightly private views of one of the park's most beautiful lakes! We'll gather as a group this evening for social hour and dinner. We'll take a break from the bike and lace up our hiking boots for an adventure you can only find in the Canadian Rockies. The group will join our local naturalists on an avid hike into Larch Valley. We'll stop at a beautiful meadow surrounded by groves of larch trees and wildflowers, under amazing views of the Valley of the Ten Peaks. 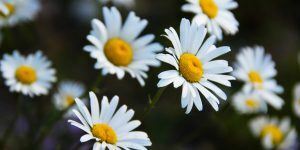 We'll talk flora, fauna and foliage, as well as geology and history of this region, and you'll emerge a true expert on the area. This afternoon, choose to explore on your terms, including a canoe on the lake, or even a swim in its glacier-fed waters. The silt runoff from upstream sedimentary rock give the lake a particularly intense turquoise color, unlike any other on the continent. Conversely, if relaxation is your thing, spend some time in an Adirondack chair with a good book or great conversation. Dinner tonight is back at our hotel. Today is classic Canadian Rockies day, as we set out on a cyclists' favorite route on Icefields Parkway. You're surrounded by peaks and glaciers on all sides as we cruise to Bow Lake for a picnic lunch. After the return ride back, we'll shuttle toward our final hotel on gorgeous Emerald Lake, but not before we stop to regale the engineering marvel of the Spiral Railway Tunnels and the Natural Bridge, a beautiful rock formation created over time by the Bow River. Our destination for the evening, Emerald Lake, is a spectacle unto itself. 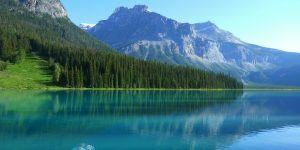 Named for its intense, jade-colored waters, this lake is located in Yoho National Park, and is the largest of the area's 61 lakes. It's a premier tourist attraction, but we'll have the opportunity to quietly enjoy it during our stay at the historic Emerald Lake Lodge. This hotel is over 100 years old and part of the story of construction of the Canadian Pacific Railway. Tonight, we'll gather for one last celebration in its famous dining room. After dinner, share stories around the fire pit with your newfound friends, and then retire at your leisure to a luxury cabin room. It's our final morning together as a group, and a great chance to relax and get in one last appointment with nature. After a delicious hot buffet breakfast and coffee, choose to take a walk around the lake—a 5km light hiking loop that allows you to take in all the beautiful surroundings one more time. Or, perhaps rent a canoe for an early morning paddle (for an additional fee). From here you will say goodbye to your guides and board a private shuttle back to Banff, where you can continue to enjoy more time in the area or make arrangements for your shuttle back to Calgary to return home. An undiscovered gem, this peaceful mountain resort retreat sits outside the busy center of town and well off the map. Rooms boast wood-burning fireplaces and cozy mountain décor. The premier accommodations feature elegant bathrooms with an old-fashioned bear-claw footed bathtub, separate stand-up shower stall and heated slate floors for extra comfort and relaxation. Enjoy the outdoor hot tub under the stars and light of the moon. And be prepared-it's not uncommon to see elk and deer feeding on the hotel grounds! Get ready to unplug and relax in this exceptional lodge accommodation. Voted by readers of Condé Nast as one of Canada's top 10 resorts last year, this luxurious retreat sits alone on a stunning lake surrounded by a dramatic mountain range in Banff National Park. The hotel is truly a vacation from all the anxieties of the modern world; it's only open in the summer season and the rooms don't include wifi, phones or television. 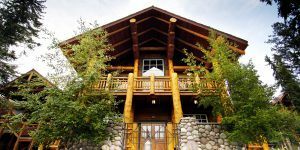 Everything here is designed to reflect the classic Canadian mountain charm, with beautiful views and fantastic hiking and canoeing right outside the door. Blissfully nestled in Yoho National Park, Emerald Lake is the ideal setting for our last night's stay. The hotel cabins provide a relaxed, rustic atmosphere while still offering a luxurious, comfortable stay. You won't be bothered by the rumblings of technology here, as the only access to telephones, internet and television can be found in the main lodge. The hotel restaurant is well-celebrated, offering up local game and seasonal items. Enjoy the clubhouse which provides a sauna, gym and hot tub to truly relax after a day of adventure. Please note: This is an explorer-level property. The terrain is varied with mountainous areas and occasional climbs. The roads are busy with tourist traffic, and the park restricts cycling to Moraine Lake Lodge and Emerald Lake Lodge, so shuttles will be provided. This trip is best suited for our Type 2-3 Riders. Our Trek Travel guides can also easily accommodate Type 1 Riders, who seek less mileage or fewer uphills, with a boost in the van. Type 3+ Riders will enjoy the extra mileage the avid route options offer. Due to the nature of the roads in this area, there are few longer routes or big climbs available. We recommend that you fly into Calgary International Airport (YYC). We suggest booking with Banff Airporter shuttle service (https://banffairporter.com/) in advance. Use our discount code "Trek" at the time of booking to receive 15% off the regular cost of travel between Calgary and Banff. The drive will take approximately 1.5 hours with departure times almost every hour. We strongly recommend planning ahead and also booking a return ticket for after the trip. Your Trek Travel guides will meet you in the lobby of the Fox Hotel and Suites (461 Banff Ave, Banff, AB T1L 1H8) at 11:00 AM on the first day of the trip. 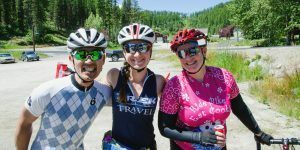 After a short shuttle, you’ll be treated to a delicious lunch of regional favorites as well as a tasting of some of the local craft beers and sodas, followed by a personal bike fitting to ensure a smooth and comfortable ride. Your guides will then present an overview of the day’s ride as well as some key safety tips and off we’ll go! Please have your first day’s riding gear handy and separate from your other luggage to facilitate the bike fitting and ride. If you will be late for the pick-up or are going to miss it altogether, please inform your guides. You will receive an email a week before the trip start with their names and contact details. If you cannot reach them, please call our first hotel, Buffalo Mountain Lodge (+1 800-661-1367) and leave a message with your expected arrival time and contact details. You will say farewell to your guides at 11:00 AM at the Emerald Lake Lodge and board a private, one-hour shuttle that will take you back to downtown Banff, dropping you back at the Fox Hotel and Suites, where you can enjoy more holiday time or book your airport transfer to continue back to Calgary airport. If you are flying out the same day, please do not book your flight any earlier than 3:00 PM in order to allow for ample travel time. This boutique, eco-friendly luxury hotel in the heart of downtown Calgary has large rooms in a modern design, a beautiful on-site spa and a great restaurant. Walk to the Arts Commons Centre and Stephen Avenue. Or relax in one of the hip, sophisticated 143 rooms with all the creature comforts. A historic landmark hotel with a truly regal feel, this hotel offers a classic style and excellent service. It is well-situated and close to many options for dining, nightlife and entertainment. Take advantage of a well-equipped health club and an onsite spa with either luxury or express package options. This convenient, all-suite hotel is a great choice for proximity to the airport. The rooms are well-appointed, comfortable and they offer a free airport shuttle service, breakfast and wifi.